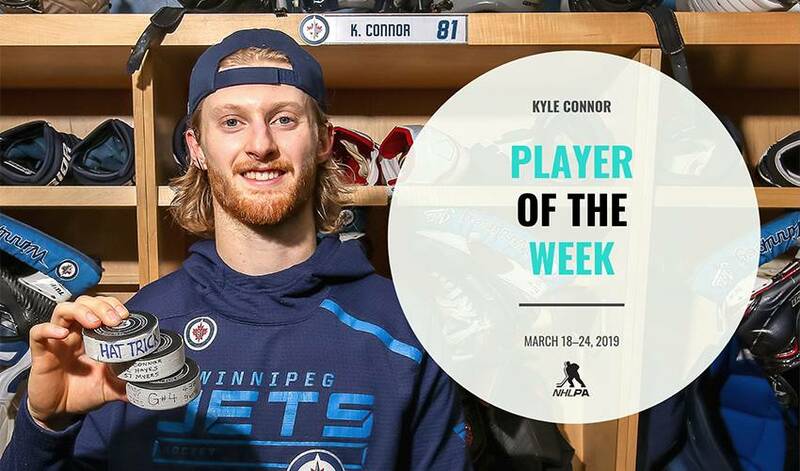 Kyle Connor helped the Winnipeg Jets punch their ticket to the Stanley Cup Playoffs in dramatic fashion Saturday by notching his first NHL career hat trick, all while leading the league in goals to extend what's been a career-best season. Not only did his hat trick earn $1,000 for the charity of his choice through the NHLPA's partnership with Enterprise, it also ensured a bit of a personal bonus for the forward who eclipsed offensive career-high numbers (currently 32-29–61) with seven more regular-season games for the Jets remaining. In addition to hat trick, Kyle Connor hits all of his bonuses...that was a $450,000 goal — clinching the last two. The Jets kicked off a three-game road trip Monday with a 3-2 win at Staples Center over the Los Angeles Kings, where Connor picked up a goal and an assist as Winnipeg eliminated the home team from playoff contention. Connor led team forwards in ice time and picked up his 27th assist of the season to surpass his previous personal best before he a power-play goal by cashing in his own rebound. He was also named the game's second star for his performance. Connor posted a second straight multi-point game when the Jets pulled into Anaheim for a 3-0 blanking of the Ducks Wednesday night, and was again named the game's second star. After assisting on the game's opening goal scored by Mark Scheifele, No. 81 positioned himself perfectly to score his 29th goal of the season with a redirection off a shot from teammate Tyler Myers. Netminder Connor Hellebuyck made 29 saves for his first shutout of the season for Winnipeg, helping the club to their fourth consecutive win and a three-point lead in the Central Division with the Jets still vying for their first division title since relocation from Atlanta in 2011-12. The Jets were on the other side of a shutout Thursday night at T-Mobile Arena as Malcolm Subban made 20 saves for the Vegas Golden Knights in a 5-0 loss for the visitors. However, the silver lining came at Bell MTS Place Saturday night when the home crowd was treated to a 5-0 win over the visiting Nashville Predators as the Jets clinched their berth in the Stanley Cup Playoffs. The win pushed Winnipeg into a four-point lead over the Preds for first place in the Central Division. Connor had a hand in four of his team's five goals as he worked toward netting his first NHL career hat trick and setting new career-highs in goals (32), assists (29), and points (61). He also led team forwards in ice time while earning the game's first star. Jets captain Blake Wheeler heaped praise on the young forward. "He's a guy that we rely on for offense and scored a huge goal for us to get us going," Wheeler said to reporters postgame. "We hadn't scored a goal for about a game and a half, so he made an incredible play there to get us on the board. Hard work pays off. He's been on the puck all year." Connor's first goal of the night stood as the game-winner, the 12th of his career so far, to pull into a tie with Evander Kane as the fourth-most by a player before his 23rd birthday in Jets' regular-season history. Connor’s third goal came on an assist by teammate Patrik Laine, who no one would have blamed if he tried to score himself, and it did not go unnoticed. "It's just the character he is. He cares about this team first and he's a very underrated passer. I don't think that gets enough recognition," Connor credited Laine's unselfish play to the Winnipeg Free Press. The Jets are currently on their last homestand of the season, and welcome the Dallas Stars Monday night (8:00 p.m. ET).